of course makes Fluttershy the doormatmouse. It’s January 19, 2013. The top song has not changed since last year, while the top movie has changed three times, consecutively Texas Chainsaw 3D, Zero Dark Thirty, and Mama. I’ve only heard of the first two, and none of what I’ve heard gives me any desire to see them. In the news since last episode, schoolgirl, blogger, and international cause celebre Malala Yousafzai is released from the hospital following her shooting, British authorities confirm over 200 sexual offenses committed by deceased children’s television presenter Jimmy Savile over a fifty-year period, and on the day this episode airs, Al Jazeera reports that the number of children killed in the Syrian civil war is over 3,500, out of more than 60,000 dead so far. You may have noticed that there’s a pattern in the news stories I chose for this article. There’s a reason for that, but first let’s discuss “Keep Calm and Flutter On,” story by Teddy Antonio, teleplay by Dave Polsky, and directed by Jayson Thiessen. There is a read in which this episode is completely innocent. In that read, Fluttershy is a patient parent or teacher dealing with a recalcitrant child. She is patient and kind while the lonely, undisciplined child acts out, until his growing attachment to her brings his behavior more or less under control. The advantage of this reading is twofold. First, it’s relatively non-problematic. It’s consistent with Fluttershy’s characterization as a caretaker, and explains why Celestial thought Fluttershy was the mare for the job. Second, it’s a relationship familiar to the primary audience. A four- or six-year-old hasn’t had much opportunity to experience friendship, but parents, tantrums, and possibly teachers are familiar concepts by that age. Unfortunately, that reading has the slight snag that there is no textual support for it whatsoever. Fluttershy positions herself as a friend to Discord, treats him as a houseguest rather than a family member, and, most importantly, is by far the younger and less powerful of the two. She is definitely not Discord’s mother-figure. While she does chide him for his misbehavior, it is no different from the way she chides Rainbow Dash at the dinner party in the episode, which is to say, she’s treating Discord as an equal. This is deeply troubling, because Discord spends the entire episode acting like a controlling, abusive boyfriend. He starts by asserting dominance over and marginalizing Angel, who, depending on which episodes you go by, is either Fluttershy’s caretaker or her prior abuser (or, of course, both). He then begins pushing Fluttershy’s boundaries, using her kindness and hospitality against her. He continually tests how far she will let him go, trashing her home and property, and when she objects, he acts like the aggrieved victim. This is classic abuser behavior, calculated to make his victim start doubting her own feelings and beliefs, thus making her easier to control. For similar reasons, he tears down her friends and acts out at the dinner party to force her to take his side against her friends, isolating her. Discord’s motive is perhaps not that of the typical abuser. He is more interested in isolating and controlling Fluttershy because it takes all of the Mane Six working together to use the Elements of Harmony against him, and thus so long as Fluttershy is kept away from her friends and under his thumb, he can wreak havoc as he pleases. On the other hand, it is an entirely selfish motivation, in which any possible affection he feels for Fluttershy (which affection he does seem to feel, if the end of the episode is anything to go by) is secondary to his desire to wield power. In that sense, this is a fairly typical abusive relationship. This plays out in Discord and Fluttershy’s relationship in this episode (which is, of course, non-romantic, but they are living together for the duration of the episode, so many of the same concepts apply). Discord spends the entire episode trying to assert his power and dominance. He deliberately usurps Angel’s role in the home, taunts and torments him, just to demonstrate his power, while also trying to manipulate and isolate Fluttershy so that he can dominate her as well–and the end goal for all of this is to eliminate the one thing that limits his power, the combined power of all six Elements of Harmony. Fluttershy, meanwhile, is deliberately exaggerating her (traditionally feminine) traits of kindness, meekness, and nurturing, playing along with Discord’s hegemonic posturing in an attempt to get him to become dependent on her friendship. The rest of the Mane Six, especially Rainbow Dash and to a lesser extent Twilight Sparkle, are horrified by this arrangement. Equestrian gender roles do not generally work like ours, and so in-character this is probably their first encounter with such toxic gender norms. They can see that the practical upshot is that Discord is taking more and more power and control, which forces Fluttershy to go to greater lengths to appease him, all the while convinced that she is in control even when it is plainly obvious to an outsider that Discord is using her. Fluttershy’s determination to reform Discord puts her in the position of trying to figure out what she can do to make him behave, which has the effect of absolving him of responsibility for his behavior–there is little difference between Fluttershy’s “I’m sure I can reach him if I keep treating him nicely” and “If I didn’t burn the pot roast, he wouldn’t have needed to hit me.” She is being abused, and like many abuse victims, resisting her friends’ efforts to get her out–which isolates her still further and makes her easy to control. So far, so good, but this is where the episode runs afoul of the existing norms and rules of the show. The best ending is for Fluttershy to realize that her relationship with Discord is toxic, get her friends, and turn him back into stone, but within the show that ending cannot occur, because it closes off future plot lines with a popular villain and suggests that there are things friendship cannot do. Instead, when Fluttershy threatens to terminate their relationship, Discord spontaneously reforms and everyone becomes friends. So remember, little girls, if fifteen years from now your abusive boyfriend feeds you the “please, baby, don’t go, I promise I’ll change” line, you should definitely stay, because he’s totally going to actually change and isn’t just desperately saying anything that will keep you in his power. And as disgusting as the ending is in that respect, it is toxic in more immediate ways as well. There is enormous pressure on young children, especially girls, to be “friends” with everyone. This episode suggests that there is a responsibility to be friendly even with people who are horrible to you and your friends, that Fluttershy’s approach of suppressing her aggressive feelings and allowing people to walk all over her to maintain their friendship will actually get them to like her enough that she can then shift the relationship to a more genuine and equal friendship. This is precisely the nonsense that forces girls into the “alternative aggressions” documented by Rachel Simmons in her Odd Girl Out, creating the toxic culture of overt “niceness” and covert nastiness, rumor-mongering, and ostracizing that explodes among girls around puberty and ruins the latter portion of the school experience for so many. Later episodes temper this somewhat by making clear that Discord is still colossally self-centered, manipulative, and sadistic, albeit more of a morally ambiguous trickster than the outright villain he was in his first appearance. In the fourth season, he is still devoted to testing the boundaries, going as far as he can without quite losing the support of Fluttershy, but at least it appears his contact with her is rather more limited. Even in a purely narrative view, deliberately ignoring the toxic implications about gender, friendships, and abuse, this is still part of Season Three’s flailing desperation, in this case the standard desperate-TV show trick of bringing back a popular villain–yet it reduces the most powerful, dangerous, and effective villain in the show to an abusive boyfriend. And yet this is not the nadir of the flail. Next week: Quite possibly the worst thing Spike has ever done. And that’s still not the nadir either! I do think (or hope) that most would just read it as being about friendship, at an age when your best friend might suddenly get in a mood and hit you or lie to you on the playground (where the best threat usually is 'I am not going to be friends with you anymore if you keep doing that'… or 'I am telling your mom'), which is a lot different from a romantic lover when you're a teen. But your review makes me wonder how that might have been made less problematic, because Discord isn't a little kid, he's an adult, and that makes everything different in context. Yeah, I think that's the section I was writing on my phone. I choose to blame autocorrect. Yeah, if Discord were a child or an animal it would be much less problematic. But I'm not sure it matters that much whether this is read romantically or not, since as a friendship it is still an incredibly toxic and abusive one. I agree he should take some kind of less extreme punishment! Maybe whatever's in that crystal that's going to replace the Elements of Harmony will help. Fun fact: This episode was literally thought up by a fifteen-year-old. I know, I just couldn't find a way to work it in. In happier news, this finally got released. The way Fluttershy treats Discord in this episode is much more like training an animal (as is appropriate for her, I suppose) than any human relationship. The way she attempts to incentivize the desired behavior in him is surprisingly cynical. Any comment on how their relationship demonstrates that friendship isn't transitive? Short version: Meghan McCarthy suggested a one sentence concept which Teddy Antonio turned into a full outline. He was then unable to complete the script (which he'd been going to do) so Dave Polsky stepped in and wrote the final script. It's also not that far off from how my brother has to treat some of the special needs folks at the group home he works at. Oh, interesting! I'll definitely have to flag that as something to consider for the book version! Right, but both of those readings are ultimately the same as the parental reading, in which Fluttershy is a caretaker and the power differential is tilted in her favor. That's not really supported by the text. Well, to the extent that abusive romantic relationships are entered into via a direct royal order to reform the abuser, which is where I start to disagree… The fact that Discord is assigned specifically to Fluttershy by Celestia because she's good with ornery animals and at settling unpleasant disputes, and that we then see Fluttershy proceed to do exactly what a good therapist does with a patient who doesn't need enabling, violence, or imprisonment gives me a much different reading of the episode. It's not that she couldn't join up and re-imprison him. All he has over her is an essentially meaningless verbal promise that she is under no compulsion to keep given his behavior. She could quit anytime she wanted, an, in fact, has the support of all her friends to do so. But instead, rather than the Ludovico technique Twilight was going to cast on him, Fluttershy goes the extra distance and does what will fix the patient, rather than give up. Oddly enough, it's that exact pressure to be friendly that causes his reform. Recognizing and realizing, perhaps for the first time, this strange and alien mind manages to consider another being's feelings and place them before his own desires. It's an ending pinched, oddly enough, from All-Star Superman, which in turn pinched it from an old issue of The Authority, where it was probably pinched it from somewhere else: the all-powerful being going on a rampage finally realizes that each and every living thing on the planet is alive and matters, and that to hurt them wouldn't be fun or novel, it would be senseless and cruel and meaningless. That next season he ends up insecure enough to worry if the person who was going to forcibly reform him via magic is actually his friend or not seems actually quite in character for many folks I've met who aren't used to having many friends. It's nothing remotely like a therapeutic relationship. A therapist does not befriend their patient, does not invite them to live in their home, does not maintain a relationship after the therapy is concluded–it's the same problem as trying to cast Twilight as Spike's mom, if Fluttershy is Discord's therapist then she is an appallingly incompetent and irresponsible therapist. 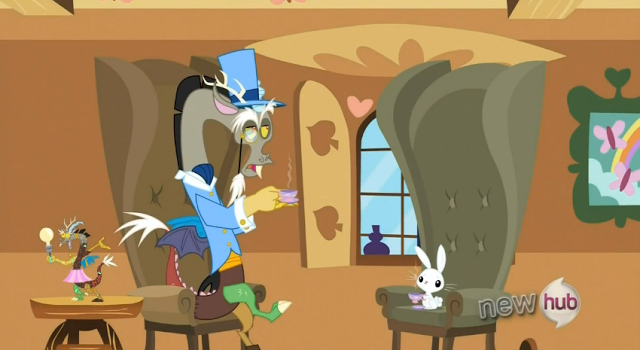 And just to be really, really clear, I'm not saying that Discord and Fluttershy are in a romantic relationship. They're in a friendship that resembles an abusive romantic relationship in disturbing ways. And yes, Celestia orders them to be friends. The episode is pretty clearly, as I've argued, coming from an “everyone is required to be friends with everyone else” perspective, and it's not hard to go from there to Celestia ordering them to be friends. It's not that different from a teacher forcing students who can't stand each other to work on a group assignment together (which happened to me ALL THE TIME in elementary school). And yeah, the pressure to be friendly is what reforms Discord. That's the problem. It shouldn't work, and depicting it as working is actively dangerous because it strengthens the toxic notion that there's something wrong with being selective in your choice of friends. One word from Fluttershy and back to stone Discord will go; the rest of the Mane Six are all eager and willing to drop the rainbow nuke on him if Fluttershy declares him irredeemable. She's hardly powerless. No, she's not powerless, but Discord is engaged in a campaign to make her feel powerless, to get her not to use that option. Just as abusers do a great deal of work to convince their victims that they're powerless. That's what's going on with his attempts to isolate her, for instance–it makes it that much harder for her to bring in the Elements of Harmony. I suppose we just disagree about how much agency Fluttershy has in the episode. I've always taken it as the third entry in the trilogy that started with Stare Master and continued with A Bird in the Hoof, where yet again Fluttershy takes on more than she can handle when it comes to reforming a sick and/or disobedient creature, and manages to do so in the end through force of will. Only this time, her gentle pressure doesn't work, and instead of cowing the children into obedience or failing to save the inevitably dying creature, she simply meets more stubborn resistance than she can handle, and has to learn to assert herself in an unorthodox way (for her and for the show, anyways) to solve the problem. If Friendship is Magic, when you take that magic away, what does a purely magical creature like Discord have left? He tries to isolate her from her friends, but, importantly, he fails to actually do so. At no point does Fluttershy lose contact or draw away or disappear from their lives. Her friends do more than enough of that on their own by treating the show like its initial brief, a Sailor Moon-esque monster killing program, by attempting to get rid of him the first opportunity they can, a theme which continues in the quite excellent fourth season episode Bats!, rather than the show about the transformative power of personal relationships that it is. I don't truck with any interpretation where Discord honestly believes he's not getting turned back to stone before the final moments of the episode. He's sure Fluttershy is a hypocrite, and that if he just acts like himself she'll inevitably give up on being kind to him. Discord never seriously attempts to isolate her from her friends, he knows full well that didn't work last time even with mind control magic, he's just trying to troll her. He's trying to make some kind of suicidal gesture, but Fluttershy won't let him die. I don't truck with any interpretation where Discord honestly believes he's not getting turned back to stone before the final moments of the episode. Discord is the most arrogant character in the show. Of course he believes he's going to win! He's trying to make some kind of suicidal gesture, but Fluttershy won't let him die. Where, anywhere in this episode, do you see evidence that Discord is suicidal? I'm sorry, I'm just utterly baffled by your interpretation of Discord. I really don't see at all where it's coming from. Maybe I just have the Batman/Joker “I'm gonna make you break your one rule and kill me” dynamic on the brain. The biggest problem I’ve always had with this ep is a problem I have with Discord in general – he’s simply too powerful to make for a satisfying character. This was easier to overlook back when he was an outright villain, since it puts the heroes into one hell of an underdog situation, but even “The Return of Harmony” suffers when you think about it too long. Magic jewelry or no, how on Earth is a being who can rearrange reality at the speed of thought supposed to be menaced in the slightest way by six ordinary ponies? In this episode, it becomes even sillier. As someone on TV Tropes observed, the Elements only become remotely capable of threatening Discord when they’re *together* – in other words, Discord can turn Fluttershy into a chair whenever he feels like it, toss the butterfly necklace into the closest volcano, and he’ll probably have the run of the place for at least a few years until our heroines find some other Deus Ex Machina to take him down with. The Mane Six/Celestia are attempting to reform him when they’ve neither carrot nor stick to offer, really.